The earliest memorial in the church to a member of the Hodsoll family can be seen in the nave to the memory of William Hodsoll of South Ash, gent who died on 27th December 1586 and who inherited South Ash from his mother on 19th March 1561. Before we look at the quitclaim it might be of interest to show the ancestors of William Hodsoll; his father was John Hodsoll and his mother was Anne, his grandfather William Hodsoll held Parsons in Stansted in 1538-9 whilst his great-grandfather was Thomas Hodsoll mentioned in his father's will and who died 1536/7. Back a futher generation is William Hodsoll of Wrotham and Ash, tenant of the Manor of Stansted, who held Parsons 1493/4 and who died in 1499. 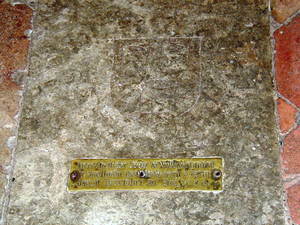 Back a further generation is William Hodsoll who married Joan - died 1455. He was the son of John Hodsole of Kemsing and Stansted where he was party to a fine 1384/5 and paid a subsidy in 1373.
presens of John Loder and John Hadsol"
Attached to the parchment is a small circular brown wax seal with the initials IW. The Landed Gentry (Hodsoll of Loose Court pedigree).